Featuring free internet access, La Divine Apartment is set in Split. Diocletian's Castle and Basilica of Saint Domnius are only 100 metres away. Each air-cooled apartment includes a balcony and outdoors terrace looking out over the back yard. Apartment, max 4 persons, close to the beach ~0.1 km, Split price per day from £ 33 This roomy apartment is founded in the residential area of Split and in its brightly colored rooms can provide you anything you need throughout your stay in this pretty city. Entertainment and Sport: TV, Satellite television. General details: air conditioner, heating, fitness, hair dryer, parking. La Divine apartment ~0.1 km, Split price per day from € 165 Featuring free internet access, La Divine Apartment is set in Split. Diocletian's Castle and Basilica of Saint Domnius are only 100 metres away. Each air-cooled apartment includes a balcony and outdoors terrace looking out over the back yard. Apartment Dolce Vita ~0.1 km, Split Apartment Dolce Vita is located within the UNESCO-listed Castle of Diocletian in Split. Domnius Basilica and Peristil are just 100 metres away. There is a seating area and a kitchen complete with a dishwashing machine and a microwave. A TV with cable channels is provided. 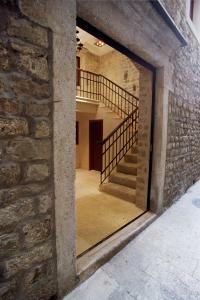 Gregory of Nin is a few steps from Apartment Dolce Vita, while Split Town Museum is a few steps from the property. 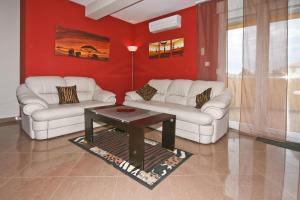 The closest flight terminal is Split Airport, 12 km from the property. Kastel Gomilica ( ~ 5.7 km ): 39+ apartments, 10+ villas. Kastel Kambelovac ( ~ 6.5 km ): 29+ apartments. Stobrec ( ~ 6.6 km ): 146+ apartments, 11+ villas, 6+ hotels. Solin ( ~ 6.6 km ): 13+ apartments. Kastel Luksic ( ~ 7.9 km ): 21+ apartments, 5+ villas, 3+ hotels. Beach Kastelet, Split ~ 0,3 km from La Divine apartment Gravel beach: ideal for families, recommended for young people, with restaurant, equipped with showers. Beach Jezinac, Split ~ 0,3 km from La Divine apartment Gravel beach: ideal for families, recommended for young people, with restaurant, with caffe bar, equipped with showers. Excellent choice of watersports. Beach Bacvice, Split ~ 0,7 km from La Divine apartment Sandy beach: recommended for young people, awarded with blue flag, with restaurant, with caffe bar, equipped with showers. Excellent choice of watersports. Beach Bene, Split ~ 0,8 km from La Divine apartment Gravel beach: ideal for families, recommended for young people, with restaurant, with caffe bar, equipped with showers. Excellent choice of watersports. Beach Zenta, Split ~ 0,8 km from La Divine apartment Rocky beach: recommended for young people, with restaurant, with caffe bar. Excellent choice of watersports. Restaurant Adriatic Graso, Split Guest reviews: 8,1/10 ~ 1,4 km from La Divine apartment Address: Uvala Baluni bb, 21000. Cuisine: Mediterranean cuisine. Restaurant Velo Misto, Split ~ 1,8 km from La Divine apartment Address: Setaliste kalafata 2, 21000. Cuisine: Mediterranean cuisine, Croatian cuisine. Restaurant Bistro Topolino, Split ~ 0,9 km from La Divine apartment Address: Obala K Domagoja BB, . Cuisine: Croatian cuisine. Restaurant Dvor, Split Guest reviews: 8,9/10 ~ 1,3 km from La Divine apartment Address: Put Firula 14, 21000. Prices: 78 HRK - 336 HRK. Cuisine: Barbecue, Mediterranean cuisine, Seafood. Restaurant Caffe bar Tenis, Split ~ 1,4 km from La Divine apartment Address: Put Firula 18, 21000.